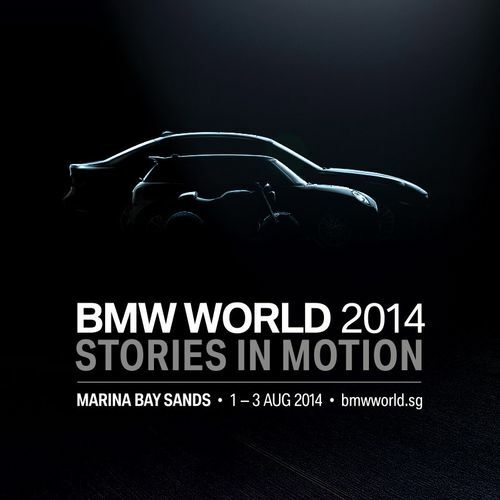 Set to be the largest single automotive group showcase in Asia, the BMW World 2014 will tell the captivating stories of BMW and MINI on innovation, design and luxury. This event will mark the start of the Future Mobility with the BMW i3, BMW i8 and the ultra-cool BMW Vision ConnectedDrive Concept Car. Other new models slated to make their debut appearance include the BMW X4 Sports Activity Coupe, the BMW 2 Series Active Tourer, the dynamic BMW M3 Sedan and M4 Coupe, as well as the latest motorcycles from BMW Motorrad bikes and the range of BMW M Performance Parts. From the MINI side, expect to see the much-acclaimed MINI John Cooper Works Concept and MINI Clubman Concept, first to be seen in Singapore. A wide range of MINI models and special edition packages will also be featured to highlight the brand's strong motoring heritage and distinct British Style.